You’ll encounter everything from top restaurants and museums to go-kart adventures, ferry rides and aquariums. Designed for the spirited traveler, this bus tour has a little something for everyone. Hop on, hop off and hop to it! Even though this tour pass gives a day of chose-your-own-adventure sightseeing, San Francisco is jam-packed with enough to-dos to last a lifetime. 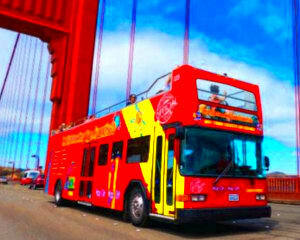 Indeed, it’s impossible to see it all in 24 hours so after you book this San Francisco bus tour, start planning! Throughout the 23 stops (of which you can get on and off as you see fit), you’ll encounter everything from top restaurants and museums to go-kart adventures, ferry rides and aquariums. Designed for the spirited traveler, this bus tour has a little something for everyone. The kids’ll love it! Hop on and off any one of the tour’s 23 stops. Benefit from your knowledgeable tour guide and learn the backstories to all the big landmarks! Travel to bay cruises and ferry rides. Head to Chinatown for a walking tour. Go to the Walt Disney Family Museum. Explore the San Francisco Museum of Modern art and de Young Museum. Greet the exotic sea life at the Aquarium by the Bay. Get your ticket to ride today and explore San Fran’s biggest attractions! Your Adrenaline confirmation that you will present at the reservation office located at 1331 Columbus Ave where you will receive your 48 hour bus ticket. Hop-On Hop-Off at 23 stops throughout San Francisco. Big savings compared to separate purchases. Choose attractions and tour when you arrive - no need to commit when you buy!